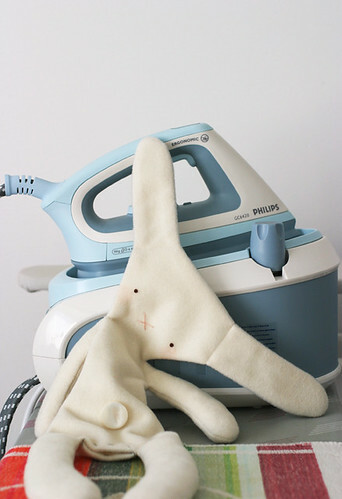 I made a special rag-rabbit to celebrate Easter. 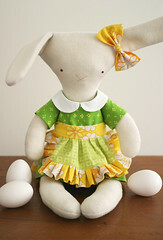 This is Esther, and she's an Easter bunny. 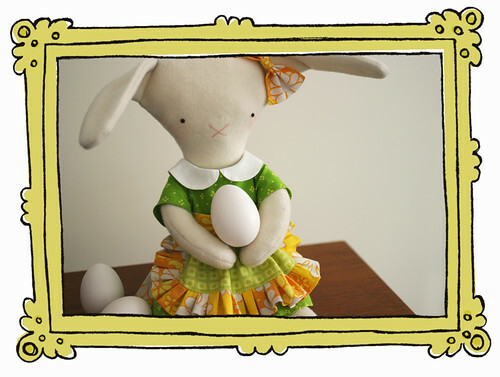 Esther likes to paint eggs and to eat chocolate. Every spring she rises fluffy little chicks and grows beautiful daffodils and she's very good at both. 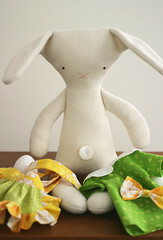 Esther is made out of soft white wool fabric and she's filled with rags and a bit of cotton batting. Her eyes are tiny, dark red buttons, and her belly button is a lovely pearly button. 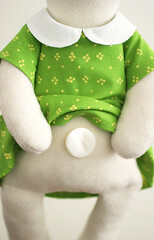 Esther's nose is embroidered and she has cute blushy cheeks. 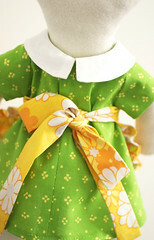 Esther is wearing a sweet green dress made out of Marimekko-print cotton fabric with a white collar. It closes in the back with a snap. She also has a fetching hare-bow made out of an old sheet and frilly apron made out of that same sheet and some Finlayson-print cotton fabric. Now, I know it's not technically Saturday anymore, but for me, the day doesn't change until I've slept and it's morning again. And I'm sure it's still Saturday somewhere in the world. Easter Saturday is called "Lanka Lauantai" in Finnish, which translates into "Yarn Saturday". Traditionally, the yarn produced during the winter was washed during Holy Saturday, hence the fun alliterative name for this particular day. I had no yarn to wash, but I did sew all day today, which is also why I'm a bit late in posting this. 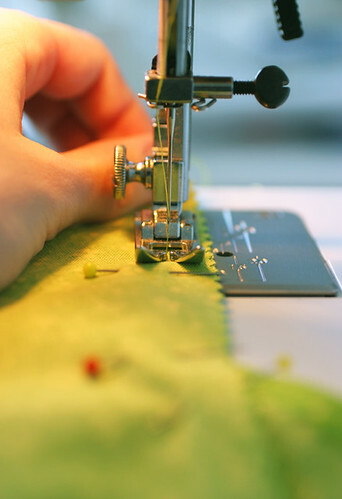 I just got into that blissful sewing groove where there's nothing else but you and the sewing machine and the needle & thread doing their magic. I've been sewing pretty much all my life, and I am still amazed how a few pieces of fabric and some thread can turn into anything and everything you can imagine. It's been a while since I last posted, despite a lot of things happening between then and now. I know I'm not the best at keeping a blog, so my updates are few and far between despite my best efforts to keep up. Any way, like I said, I've lots of things to post about! Since I last posted over a month ago (such a long time! ), there's been a few new arrivals: my Spoonflower test swatch came and The Terrific Trio returned home from their travels in Seattle. I hope to clobber together a proper post about both of these later. I also started a new hobby, Chadô (literally translated into "The Way of Tea", you can learn more about it here: http://en.wikipedia.org/wiki/Chado), learning the art of Japanese tea. I've had two lessons so far, and it's all been lovely and exciting. I take pleasure in how the very simple and plain is made beautiful, how every action is thought out and performed with grace and how, in the end, it's really all about making a good bowl of tea. 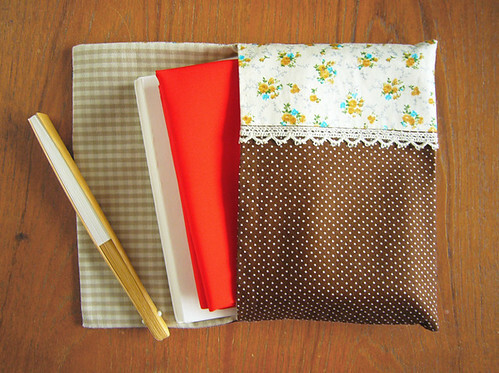 I made a fukusabasami (a little pouch for the bits and pieces needed during the tea gathering) and while it took me a few hours to decide on what fabrics to use and at one point I even though I have too much fabric (that was a fleeting thought and it wasn't entertained for long at all), I'm very happy with it. It got lots of compliments from everyone at the tearoom too.